So with all of my health problems I have definitely become a Netflix aficionado. I always like to have some kind of TV going for background noise as I do things throughout the day so I'm pretty much always watching Netflix. I power through shows and sometimes feel like I'm running out of stuff to watch, but thankfully Netflix is pretty much never ending and I can always find something new! Since I spend so much time binging I figured it was my duty to share some of my favorite shows with all of you. Below I'm breaking down what I'm currently watching, what I've recently watched, and some of my favorite binge watches I've had over the years. I just started this the other night and am almost finished with the first season. The first season focuses on the investigation of the death of a high school student and shows what's going on in both her family's life and the life of the lead detective during the investigation. I really like crime dramas (both shows and books), which is why I decided to watch this and so far it's not disappointing. I'm dying to see where the investigation leads, which is why I'm tearing through this! A Netflix original series about the start of women's wrestling. GLOW stands for Gorgeous Ladies of Wrestling, which might sound sexist, but the show actually has a lot of female empowerment undertones. It's both funny and dramatic and super interesting if you've ever watched Total Divas. This is only on it's first season and each show is 30 minutes so it's a quick watch. This is a CW show that just finished its first season and was recently put on Netflix. I started watching this when it was on TV, but for some reason stopped and was so glad I could finish it on Netflix so I could see what happened. This show features a captivating murder mystery (which I love) along with lots of other juicy doings that are happening in the (sometimes creepy) little town of Riverdale. The murder mystery that looms through the season does get solved by the end, but then we're left with a cliffhanger (and new mystery) that has me itching for season two! I've been watching this Canadian drama for a few years now; the series is ongoing on Canadian TV, but I have to wait for the new seasons to make it to Netflix so I am always excited when a new one does. It's about a multigenerational family that owns a ranch in Alberta, Canada and shows how they go through their lives. It's filled with tons of juicy drama and plenty of adorable farm animals and beautiful horses that play major parts in the show. So I know everybody and their brother has probably recommended this to you, but let me tell you it's because it really is that good. If you're living under a rock and don't know what the show is about, it's about a typically law abiding woman who is sentenced to jail time for an old crime and how life unfolds inside a women's prison. If you haven't watched this then you need to start ASAP and will finish it quickly because once you start you won't want to stop. I will admit though that after Seasons 1-4 I had high hopes for Season 5 and was a little disappointed with it. There's nothing like a 90s TV show in my opinion! I was too young to watch when Party of Five was on TV, but I'm so glad that Netflix gave me the chance to watch this 90s classic. It's about five siblings whose parents are killed in a car crash leaving them under the care of the oldest brother. It goes through all of the trials and tribulations they experience both as orphans and as they grow up. If you liked shows like 7th Heaven then this is a must watch! Also some of our favorite stars from the 90s and today make cameos, which is so fun to see. It would be impossible to share all the shows I've watched on Netflix as I can't even remember them all myself! 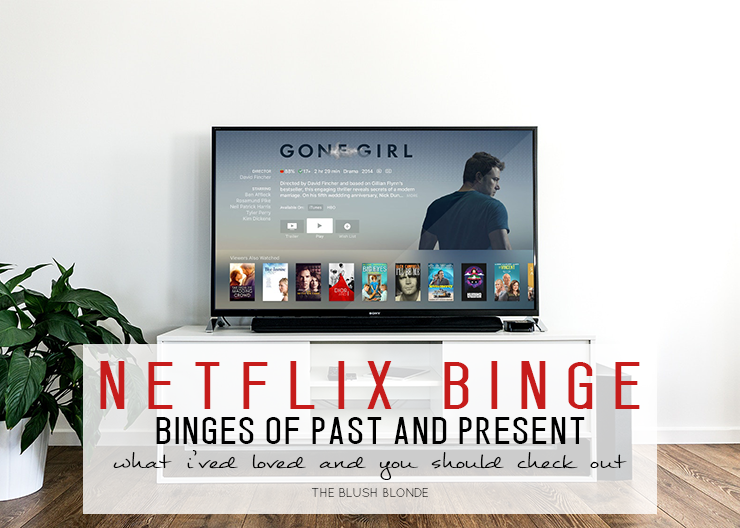 Here though I have for you fifteen of my favorite binges (not ranked, just in alphabetical order) that I definitely recommend checking out next time you're looking to watch something on Netflix! What have been your favorite Netflix binges? Comment them below so I can add them to my list of shows to watch! I LOVE The Killing! It's so good! Also a huge fan of Grey's, Breaking Bad, Gilmore Girl's and Shameless! Riverdale?! Uh, YES! I was obsessed with that. So heartbroken that the new season isn't coming out for so long! 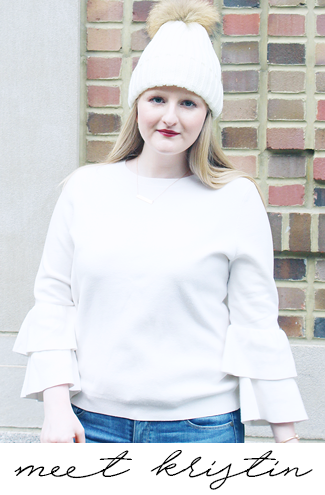 I loved Shameless and White Collar as well, so I think I need to check out the rest of your list! So many good shows! I love Gilmore Girls, Scandal, Gossip Girl, How to Get Away with Murder, Orange is the New Black, Weeds, Desperate Housewives, etc haha! I've watched so many! The Killing is my favorite show of alllll time. It's seriously so well done! I love the Danish version, too. I definitely need to check out The Killing and Riverdale. If you're looking for cute comedies, Baby Daddy and Young and Hungry are two of my favorites! omg I do the same thingggg!!!! when all else fails... Gossip Girl! I am a serious binge watcher. Working from home, it is not hard to put on a series and be done in a couple of days. I just love to have tv on in the background. Army Wives and Friday Night Lights are always my go-to binges! Also, if you haven't had the chance already, check out Parenthood and The Night Shift! I've heard Riverdale is really good, I need to start it! So many goodies in here that I haven't seen yet! I am watching Gypsy right now which is kinda odd but really good. The Killing is AMAZING! I am currently binging Shameless and it's amazing! Also, I love Army Wives, Bones, Scandal, FNL, and Gilmore Girls! I just started Riverdale. I don't have an opinion just yet. The first season of The Killing is great. I need to give the second season another try. I gave up after episode 2. Have you watched The Fall? It's only 3 seasons and so good! It's similar. The killing is gold. Which I have never seen it so I could watch it again for the first time. I need to start riverdale, it's on my list! so excited it's on netflix! I totally need to check out these shows! I totally finished all of my other ones.